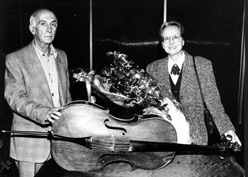 Svetlana Shafran gave the Maestro's Amati as a gift for the Glinka Museum at the September 1997. To the left is Mr. Oganezov, the instrument restorer. Please accept my deep appreciation for your webpage about Maestro. With all good wishes.